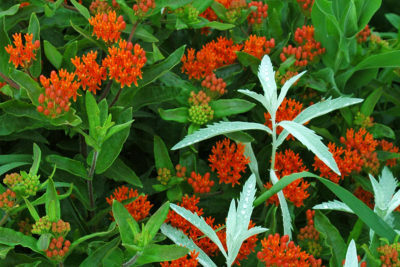 In July, the native plant garden shifts into summer. Plants reach full height, more species come into bloom, insects call, and fledging songbirds make short flights. Mosquitoes, dragonflies, and swallows circle overhead and young-of-year animals dart into garden beds. Gardening tasks include planting on cooler days, weeding, edging, mulching, and monitoring each area. The last task, best done when plants are mature or already in bloom, allows us to compare plant composition year-to-year. Also, we monitor pollinators’ resource and habitat use, phenology, and behavior. Many questions arise about plants that have “-wort” or “-weed” in their name—what does that mean? The suffix “-wort” simply means “plant.” In earlier centuries, plant common names often referred to physical characteristics, resemblance, or recommended medicinal uses. For example, in the mid 19th century, garlic mustard (Alliaria petiolata) was known as “garlick-wort” and was considered weedy, even in its native region (Eurasia). Liverwort, a small non-vascular plant, has a branched thallus resembling the lobes of the liver. The native smooth forked nailwort (Paronychia canadensis) was thought to be a cure for inflammation of fingers and toes. Dozens of species still have common names ending in “-wort,” reflecting similar historical perceptions or uses. Several are familiar in summer landscapes and widely available for garden use. This month, spiderwort (Tradescantia ohiensis) begins to drop its seeds after weeks of blooming. You can collect flower heads and store them in a dry place or cover them with netting in the field. The large seeds will mature and drop over a few weeks, corresponding to the blooming time. Spiderwort will self-sow in gardens where there is some open space and little shading. Bishop’s-cap, or two-leaved miterwort (Mitella diphylla) disperses seeds from small cap-like fruits, which mature this month. This small spring-flowering plant grows in full or partial sun, under dry to mesic conditions in rich well drained soils. Blooming for native and non-native species of St. John’s wort (Hypericum spp.) ends this month, and upright cone-shaped capsules develop. Seed can be collected from these when they begin to split open at the top. American (or early) figwort (Scrophularia lanceolata) and eastern (or late) figwort (S. marilandica) are tall plants suited to open areas or woods edge in larger gardens. Despite their small flowers, both species are valuable to a range of pollinators. The former produces mature seed late this month, while the latter begins blooming in July. Another valuable nectar source for bees and hummingbirds is the figwort (or blue) giant hyssop (Agastache scrophulariaefolia) in the mint family. It resembles the figworts in vegetative condition but has spikes of flowers that bloom in August. The tiny flowers of Louisiana sagewort or white sage (Artemisia ludoviciana) begin blooming this month. This plant can spread aggressively in dry open sites. If planted among already established plants, it will spread by rhizome but may not overtop other plants. Its bright white foliage is its most attractive feature. Next month we will explore “-weeds.” In the meantime, enjoy the peak of summer in your garden!